There hasn't been a Monday Mani in a couple of weeks so I am sorry about that. But this week is all about my nail care essentials. 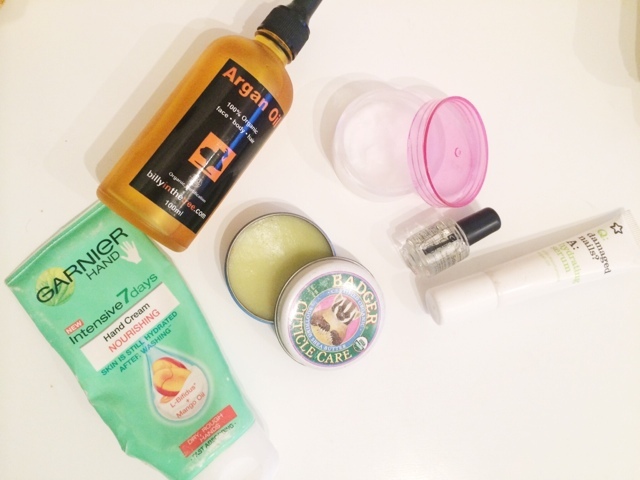 With the change if seasons, nail polish colours get darker, weather gets colder and skin gets drier so I thought I would share some of the products I use on a regular basis to make sure my nails are shaped, filed, and hydrated. I have straight nail clippers which are think are marketed as being for your tootsies, but these have a straight edge in which makes it so much easier to shape, as I prefer a square-er nail. A nail file is always something I carry with me as it's so annoying to break your nail and not have a file in your bag. Although most people believe it's bad for your nails to file them back and forth, it's actually not, I read an article the other day about the misconception and if I can find it I will link it somewhere at the end of this post. 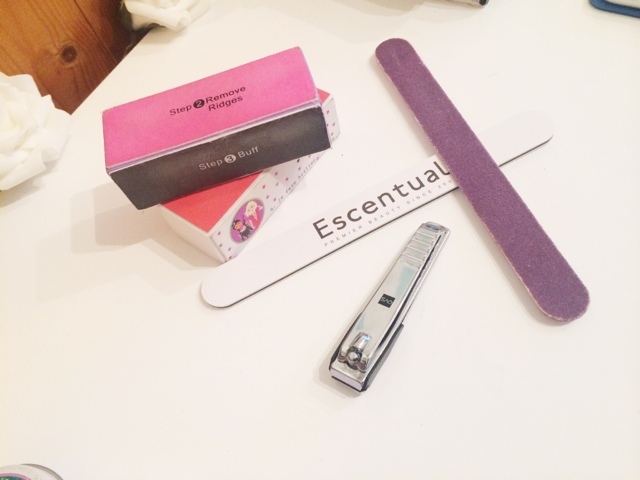 If you have quite brittle nails then you will need a nail filer which isn't so coarse. Nail buffers are always handy to have too. I cannot stand wearing nail polish when I have ridges in my nails. I use these 4 step blocks which have step 1 for filing, step 2 for removing ridges, 3 to buff and 4 for shine. These are brilliant and are so cheap. 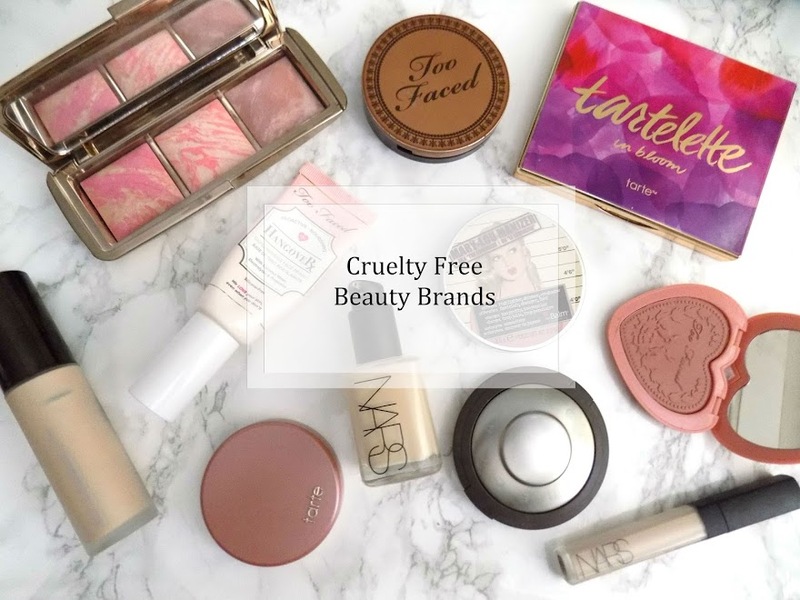 Any of these items can be found at beauty supply stores, Boots & Superdrug, and the nail clippers shown in the picture above is from the brand QVS. Fact: Nails are more likely to become brittle and break the longer they are, so make sure you give them regular trims. This step is so important for me, especially at the time of year, most of these things I have in a little box on my bedside table so I can apply some of these before I go to bed each night and I see a huge difference. Starting with cuticle oil, the one that looks like a mini nail polish is from CND and it's their Solar Oil Nail & Cuticle Conditioner and although I don't use this as much as the other products, this is still a really good cuticle oil, I just find it's more hassle than some of the other products I use. Next is Argan Oil and Coconut Oil. These are multipurpose oils and are so good for nourishing and hydrating. For a budget friendly option, these are really cheap and effective. Next one is from Superdrug own brand and it's the Hydrating Serum which contains Argan Oil as well. This is really easy to apply as it's in a squeezy tube, so I normally apply this one to work and just massage it in to my nails and cuticles. This is also a really good budget option. Finally, is my favourite cuticle treatment which is the Badger Cuticle Care. This stuff is amazing. Anyone ever get really dry hands and nails, or pick the skin at the side of their nails when they're stressed or anxious? Yeah me to. Apply this numerous times a day and after about 3 days, the skin will be healed. I have had this particular pot for a year and a half and you can see I've made a decent dent in it but I use it every day and every night before bed. Even as I'm writing this I just have to put some on. I love it and this can be found on feel unique and many other places for under a fiver I believe. Well worth it. Finally for this section is hand cream. I have quite a few tubes in each bag I own, two on my bedside table and even one on my dressing table but this is my favourite of the bunch. This is the Garnier Nourishing Hand Cream with Mango and I love it. It's so moisturising, makes my hands so soft and it sinks in so quickly so it's perfect when I'm at work typing all day. It's again, super cheap and I think it's the best hand cream ever. Base coat is something I am not consistent with as I haven't found one I really like yet, but I do tank it's important to use, especially now with the darker polishes being worn, to prevent your nails from getting stained. It's not always something that can be stopped but if we can prevent even a little bit then it's worth it (although stick around as there's a little tip to get rid of staining on your nails). So the one I am using at the minute is the Nail Girls which is actually a base coat and top coat as well as a nail strengthener which I didn't actually know so safe to say I haven't used as that but I think it's a decent base coat, doesn't stop staining completely but every little helps. I got this in a glossy box so I'm not 100% sure where you can get it from but there's plenty of base coats available in the drugstore. Finally is nail polish remover. If you can get an acetone free one then by all means do so. I actually don't, although I don't have particularly brittle or weak nails and the remover I use is quite conditioning which is good. 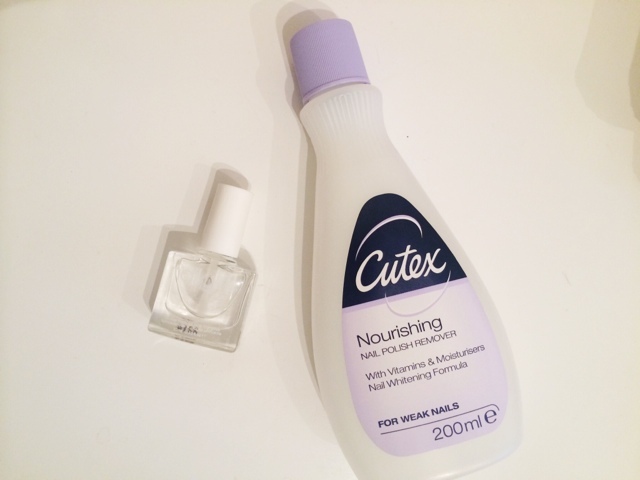 So I use the Cutex Nourishing Nail Polish Remover, which does have acetone in, which to be honest, I didn't even know until I came to writing this post. But this is the only one I use now. I just think it's the best, doesn't dry my nails out and removes everything pretty easy and quickly. I mentioned this in the last Monday Mani as well but when your nails get stained from a dark polish, it's unsightly when you have your nails bare for a few days. So here's a quick way of getting rid of that staining. Using some whitening toothpaste and a nail brush, scrub your nails making sure to get the toothpaste on each and everyone, work it in with the nail brush. Rinse and re-apply if needed. This will get most of it off but not all. Once you have as much off as possible, go in with your nail buffer, and gently buff at your nails - this will also remove ridges too. When you're done, your nails will be stain free, smooth and prepped for your next polish. If you're leaving them bare, go over with the polish side of the nail block to give a nice shine. There are other ways to do this but I prefer this way as it's quick and simple and does the job. I hope you found this post helpful. If you have any nail care recommendations then please leave them in a comment or message me. I'd love to try out some new products. 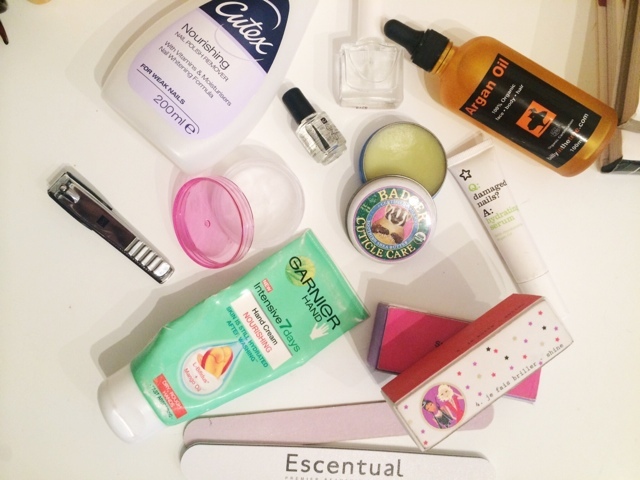 What are your favourite nail care products?